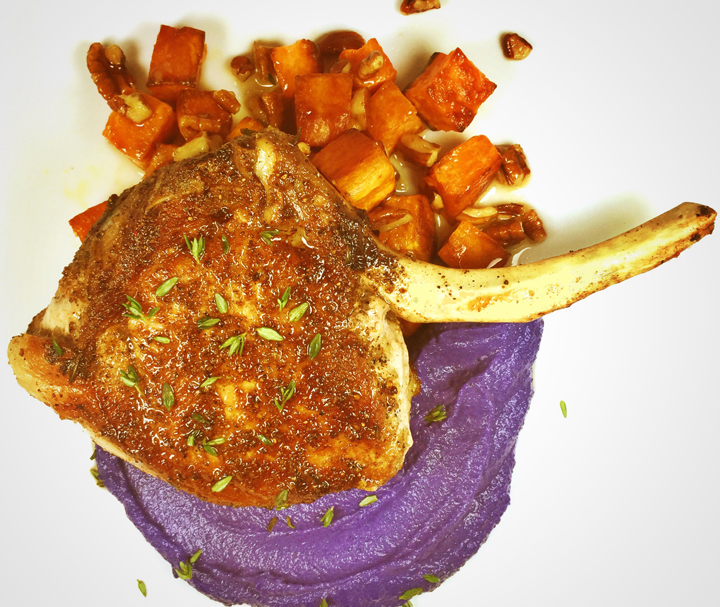 We contrasted our brilliant purple cauliflower mash with bright orange roasted sweet potatoes, coated with buttery maple and pecan syrup. We topped it off with a “seared to perfection” extra thick cut pork chop. Fall never looked or tasted so good. Ask your butcher to remove the meat from the bone and “French” the pork chops for you. Purple cauliflower is in season; you can find it at Whole Foods. Heat oven to 400 degrees. If using cumin seeds, in a small skillet over medium heat, toast the cumin seeds. Add to a spice grinder with ½ teaspoon salt, ½ teaspoon pepper and grind to a fine powder. If using ground, toasted cumin, combine in a bowl with ½ teaspoon salt, ½ teaspoon pepper. With paper towels, dry off the pork chops on all sides; rub with the dry seasoning mixture. Heat a 10” cast iron pan to medium-high; add the oil. When the oil is hot, add the pork chops. Sear until each side is golden, spooning the oil over chops and bone. Sear all sides about 4 minutes total. Place in oven and roast until 135 degrees about 6 minutes. Plate and sprinkle with fresh thyme. Serves 4, ½ pork chop per serving. 2 sprigs thyme, tied together with butcher’s twine. Break or cut the cauliflower into small, regular size florets (about 1 1/2 inch). Cut off the stems, using only the purple tops, and add them to a steamer insert. Bring 1 inch of water to a boil in the steamer pot, add the insert, cover, and steam for about 15 minutes, or until a small knife passes easily through the thickest part of cauliflower. While the cauliflower steams, in a small saucepan heat the cream and thyme to a simmer. Cook for 15 minutes then remove the thyme bundle and discard. Add about 50% of the cauliflower into a food processor. Add 1/4 cup of the warm cream, and purée until smooth. Add the rest of the cauliflower, 1 tablespoon of cream, and purée again. If the mash is still too thick (it should have the consistency of mashed potatoes) add 1 tablespoon of cream at a time and pulse until you achieve the correct consistency. Scrape down the sides of the food processor, add the salt, pepper, and puree briefly to combine. Taste for seasoning and adjust with more salt and pepper, if needed, and serve warm. Serves 4. Heat oven to 325 degrees. Place the pecans on a baking sheet and toast for 8-9 minutes until slightly darkened and nutty smelling. Remove from oven and set aside. Increase the oven temperature to 375 degrees. Place cut sweet potatoes in a bowl, drizzle with the oil. Season well with salt and freshly ground black pepper, and toss to coat. Place on a baking sheet and roast, turning halfway through, until golden and tender when pierced with a knife, about 30 to 35 minutes. Meanwhile, melt the butter in a small saucepan over medium heat. Add the maple syrup, cayenne, and pecan pieces; simmer for 2 minutes. Add the hot potatoes into a serving bowl and pour the butter maple nut mixture over; serve warm. Makes 4 servings.